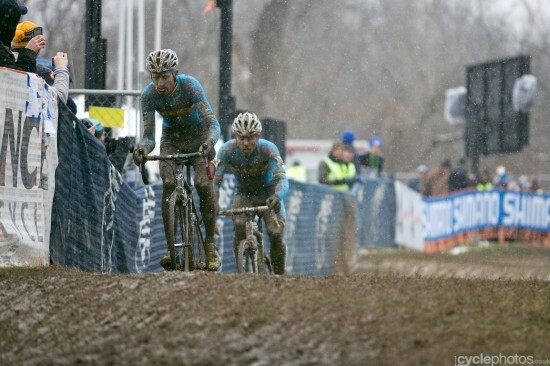 Sven Nys and Klaas Vantornout battle it out in Louisville. Photo: Balint (http://cyclephotos.co.uk/). As the post worlds bourbon hangover wears off for most American cross fans, racing continues for a few more weeks across the pond. This past Wednesday saw four-time World Champion Bart Wellens pick up a victory ahead of newly crowned World Champion Sven Nys. On Saturday, the European contingent will head to Lille for Krawatencross which also acts as the sixth round of the Bpost Bank Trofee. The Superprestige series continues on Sunday in Hoogstraten. Last year, both races were won by Tom Meeusen, who is still suspended due to his relationship with a doctor who is under investigation for doping. The Bpost Bank Trofee is all but over as Niels Albert has a commanding, 3:53 lead with three rounds to go. The maximum time a rider can lose in a single race is five minutes, meaning if Albert can put another minute into Kevin Pauwels (currently second), he could actually DNF a race and still win. Klaas Vantornout is third overall, over six minutes behind Albert. The Superprestige series is a much tighter affair with the top three separated by less than 10 points. Nys leads the overall as he attempts to capture his third straight title and the 12th of his career. With two rounds remaining, Nys leads Albert by five points, while Pauwels sits three points behind Albert in third. Kevin Pauwels – after suffering from a dropped/jammed chain at Worlds, Pauwels quickly dropped out of the lead group and was unable to recover finishing a disappointing 12th. Pauwels won here in 2011 and I like his odds of another victory. Albert and Nys are on form as is Wellens, which means it will be a tough race. Since 1999, one of the aforementioned riders has won this race except in 2003 (Arne Daelmans) and last year (Meeusen). Sven Nys – the newly crowned World Champion would love to finish this season in the same dominating fashion he started the season. Wednesday’s race was an anomaly as Nys was suffering from jet lag and partying. While he could win on Saturday, I expect him the land on the podium, just shy of the top step. Niels Albert – after a disastrous showing at worlds, Albert rebounded with a third place finish on Wednesday. Look for the former champ to keep the pressure on as he begins to wrap up the overall. He can afford to lose a bit of time, but since this series is based on time, he’ll have to keep things somewhat in check. Look for him to podium in Lille. Sven Nys – as with most races, Nys is a multi-time winner in Hoogstraten. Since his first victory in 2000, he has won this race six times. Nys has well over 50 Superprestige victories and should use this race to cement his 12th overall title. It should be a good battle, but I expect Nys to reign supreme on Sunday. Klaas Vantornout – after coming up just short of the Belgian/World title double, look for the Belgian champ to challenge Nys like he did in Louisville. In the end, I’m giving the edge to Nys, but if Vantornout can triumph in Hoogstraten, it will become a three-way battle for the overall heading into the final round. Niels Albert – Albert needs to win, or beat Nys by at least two spots to close the gap in the overall. While I think Albert will rebound from his poor showing in Louisville, I feel like everything is in Nys’ favor right now. Look for Albert to podium on Sunday after making a few bids for a solo victory. This entry was posted in Races and tagged bpost bank trofee, Cyclocross, europe, kevin pauwels, klaas vantornout, niels albert, superprestige, sven nys. Bookmark the permalink.